Mechanical eyelet sewing machine with speed 1900 st/min. Daily productivity per 7-hour shift is 3400 sewn eyelets. Machine stopping activated by a pulley locates the brake in the way that machine rotates during braking. Damping the inertia force before actual stopping prolongs the machine lifetime. Machine is equipped by wick lubrication; oil level gauge indicates low oil level to the operator. This protects the machine from a serious damage which can be caused by running the machine with insufficient oil filling. A single driving belt ensures higher effectivity of the force transfer from the machine motor to sewing mechanisms. An aluminous plate instead of a casting reduces the machine weight by 1/3 and also minimizes a pressure and wear-out of the machine parts, thus prolonging the machine lifetime. 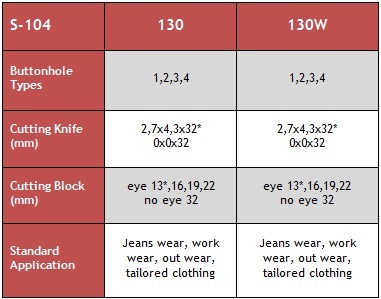 Machine usage according to the technology procedures: made-to-measure garment, outwear, waistcoats, work-wear, and jeans. High Speed Sewing up to 1,900 spm. Semi-Automatic Lubrication increases machine life. Oil Level Indicator warns the operator or mechanic when the machine is low on oil, preventing severe damage which can be caused by running the machine without enough oil. Single Belt Drive provides a more efficient transfer of power from the motor to the sewing mechanisms. Revolutionary Stop Motion contributes to improved product quality by virtually eliminating "double stops" which may result in sewing defects. The roller activation ensures one full revolution to absorb the momentum every time, prolonging the life of the machine and increasing reliability. Advanced Materials & Technology reduce stress and inertia on moving parts to increase machine life and reduce maintenance. Widest Selection of Available Models, each designed for specific customer application requirements. 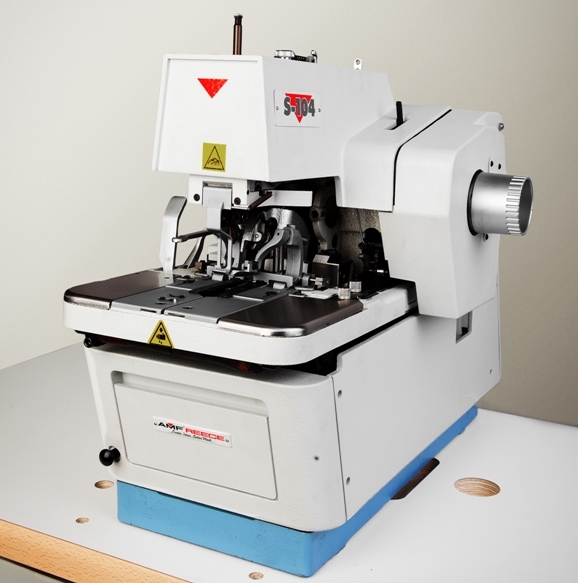 The 104-100 is our finest, most productive mechanical eyelet buttonhole machine available, incorporating advanced features to improve quality, reliability and ease of use. Description: Adjustable Flybar model with cut before and cut after application. To view available sewing patterns please click here. The only difference between this model and the 130 model (see above) is that the 130W model comes with the waistband clamp feet. These specially designed feet have a very narrow foot to allow for a closer contour of the buttonhole and clamping of the fabric inside the waistband folds. Waistband clamp feet are shorter than normal clamp feet and cannot be used on applications longer than 19mm.